The ancient Egyptians had an elaborate set of funerary practices that they believed were necessary to ensure their immortality after death (the after life). These rituals and protocols included mummifying the body, casting of magic spells, and burial with specific grave goods thought to be needed in the Egyptian afterlife. The burial process used by the ancient Egyptians evolved throughout time as old customs were discarded and new ones adopted, but several important elements of the process persisted. Although specific details changed over time, the preparation of the body, the magic rituals involved, and the grave goods provided were all essential parts of a proper Egyptian funeral. Professional mourners in an eloquent gesture of mourning. Though no writing survives from Predynastic Egypt, scholars believe the importance of the physical body and its preservation originated there. This would explain why people of that time did not follow the common practice of cremation, but rather buried the dead. Some also believe they may have feared the bodies would rise again if mistreated after death. Early bodies were buried in simple, shallow oval pits, with a few burial goods. Sometimes multiple people and animals were placed in the same grave. Over time, graves became more complex, with the body placed in a wicker basket, then later in wooden or terracotta coffins. But the latest tombs Egyptians have made are sarcophaguses. These graves contained burials goods like jewelry, food, games and sharpened splint. This demonstrates that this ancient period had a sense of the afterlife, though archaeological evidence may show the average person had little chance of getting into it. This may be because admission required that the deceased must be able to serve a purpose there. The pharaoh was allowed in because of his role in life, and others needed to have some role there. Human sacrifices found in early royal tombs reinforce this view. These people were probably meant to serve the pharaoh during his eternal life. Eventually, figurines and wall paintings begin to replace human victims. Some of these figurines may have been created to resemble certain people, so they could follow the pharaoh after their lives ended. Note that not only the lower classes had to rely on the pharaoh’s favor, but also the noble classes. They believed that when he died, the pharaoh became a type of god, who could bestow upon certain individuals the ability to have an afterlife. 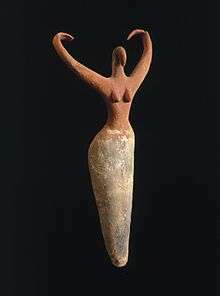 This belief existed from the predynastic period through the Old Kingdom. Though many spells from the predeceasing texts were carried over, the new coffin texts also had additional new spells added, along with slight changes made to make this new funerary text more relatable to the nobility. In the First Intermediate Period, however, the importance of the pharaoh declined. Funerary texts, previously restricted to royal use, became more widely available. The pharaoh was no longer a god-king in the sense that only he was allowed in the next life due to his status here, now he was merely the ruler of the population who upon his death would be leveled down towards the plane of the mortals. The first farmers in Egypt are known from the villages of Omari and Maadi in the north. The people of these villages buried their dead in a simple, round graves with one pot. The body was neither treated nor arranged in a regular way as would be the case later in the historical period. Without any written evidence, there is little to provide information about contemporary beliefs concerning the afterlife except for the regular inclusion of a single pot in the grave. In view of later customs, the pot was probably intended to hold food for the deceased. Funerary customs developed during the Predynastic Period from those of the Prehistoric Period. At first people excavated round graves with one pot in the Badarian Period (4400-3800 B.C.E. ), continuing the tradition of Omari and Maadi cultures. By the end of the Predynastic Period, there were increasing numbers of objects deposited with the body in rectangular graves, and there is growing evidence of rituals practiced by Egyptians of the Naquada II Period (3650-3300 B.C.E). At this point, bodies were regularly arranged in a crouched or fetal position with the face toward either the east the rising sun or the west (which in this historical period was the land of the dead). Artists painted jars with funeral processions and perhaps ritual dancing. Figures of bare breasted women with birdlike faces and their legs concealed under skirts also appeared in some graves. Some graves were much richer in goods than others, demonstrating the beginnings of social stratification. Gender differences in burial emerged with the inclusion of weapons in men's graves and cosmetics palettes in women's graves. By the First Dynasty, some Egyptians were wealthy enough to build tombs over their burials rather than placing their bodies in simple pit graves dug into the sand. The rectangular, mud-brick tomb with an underground burial chamber, called a mastaba, developed in this period. These tombs had niched walls, a style of building called the palace-façade motif because the walls imitated those surrounding the palace of the king. Since commoners as well as kings, however, had such tombs, the architecture suggests that in death, some wealthy people did achieve an elevated status. Later in the historical period, it is certain that the deceased was associated with the god of the dead, Osiris. 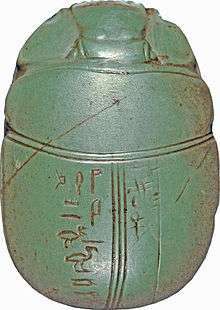 Grave goods expanded to include furniture, jewelry, and games as well as the weapons, cosmetic palettes, and food supplies in decorated jars known earlier, in the Predynastic Period. Now, however, in the richest tombs, grave goods numbered in the thousands. Only the newly invented coffins for the body were made specifically for the tomb. There is also some inconclusive evidence for mummification. Other objects in the tombs that had been used during daily life suggests that Egyptians already in the First Dynasty anticipated needing in the next life. Further continuity from this life into the next can be found in the positioning of tombs: those persons who served the king during their lifetimes chose burials in close proximity to their lord. The use of stela in front of the tomb began in the First Dynasty, indicating a desire to individualize the tomb with the deceased's name. 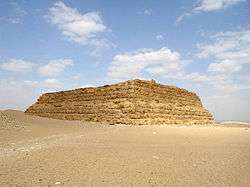 In the Old Kingdom, kings first built pyramids for their own tombs surrounded by stone mastaba tombs for their high officials. The fact that most high officials were also royal relatives suggests another motivation for such placement: these complexes were also family cemeteries. Among the elite, bodies were now mummified, wrapped in linen bandages, sometimes covered with molded plaster, and placed in stone sarcophagi or plain wooden coffins. 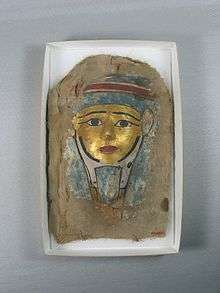 At the end of the Old Kingdom, mummy masks in cartonnage (linen soaked in plaster, modeled and painted) also appeared. Canopic containers now held their internal organs. Amulets of gold, faience, and carnelian first appeared in various shapes to protect different parts of the body. There is also first evidence of inscriptions inside the coffins of the elite during the Old Kingdom. Often, reliefs of every day items were etched onto the walls supplemented grave goods, which made them available through their representation. The new false door was a non-functioning stone sculpture of a door into the tomb, found either inside the chapel or on the outside of the mastaba; it served as a place to make offerings and recite prayers for the deceased. Statues of the deceased were now included in tombs and used for ritual purposes. Burial chambers of some private people received their first decorations in addition to the decoration of the chapels. At the end of the Old Kingdom, the burial chamber decorations depicted offerings, but not people. The political situation in the First Intermediate Period, with many centers of power, is clearly reflected in the many local styles of art and burial at this time. The many regional styles for decorating coffins make their origins easy to distinguish from each other. 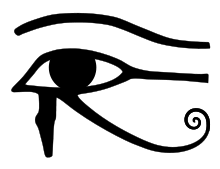 For example, some coffins have one-line inscriptions, and many styles include the depiction of wadjet eyes (the human eye with the markings of a falcon). There are also regional variations in the hieroglyphs used to decorate coffins. Occasionally men had tools and weapons in their graves, while some women had jewelry and cosmetic objects such as mirrors. Grindstones were sometimes included in women's tombs, perhaps to be considered a tool for food preparation in the next world, just as the weapons in men's tombs imply men's assignment to a role in fighting. Burial customs in the Middle Kingdom reflect some of the political trends of this period. During the Eleventh Dynasty, tombs were cut into the mountains of Thebes surrounding the king's tomb or in local cemeteries in Upper and Middle Egypt; Thebes was the native city of the Eleventh Dynasty kings, and they preferred to be buried there. But the Twelfth Dynasty, high officials served the kings of a new family now ruling from the north in Lisht; these kings and their high officials preferred burial in a mastaba near the pyramids belonging to their masters. Moreover, the difference in topography between Thebes and Lisht led to a difference tomb type: in the north, nobles build mastaba tombs on the flat desert plains, while in the south, local dignitaries continued to excavate tombs in the mountain. For those of ranks lower than royal courtiers during the Eleventh Dynasty, tombs were simpler. Coffins could be simple wooded boxes with the body either mummified and wrapped in linen or simply wrapped without mummification, and the addition of a cartonnage mummy mask. Some tombs included wooded shoes and a simple statue near the body. In one burial there were only twelve loaves of bread, a leg of beef, and a jar of beer for food offerings. Jewelry could be included but only rarely were objects of great value found in non-elite graves. Some burials continued to include the wooden models that were popular during the First Intermediate Period. Wooden models of boats, scenes of food production, craftsmen and workshops, and professions such as scribes or soldiers have been found in the tombs of this period. Some rectangular coffins of the Twelfth Dynasty have short inscriptions and representations of the most important offerings the deceased required. For men the objects depicted were weapons and symbols of office as well as food. Women's coffins depicted mirrors, sandals, and jars containing food and drink. Some coffins included texts that were later versions of the royal Pyramid Texts. Another kind of faience model of the deceased as a mummy seems to anticipate the use of shabty figurines (also called shawabty or an ushabty) later in the Twelfth Dynasty. These early figurines do not have the text directing the figure to work in the place of the deceased that is found in later figurines. The richest people had stone figurines that seem to anticipate shabties, though some scholars have seen them as mummy substitutes rather than servant figures. 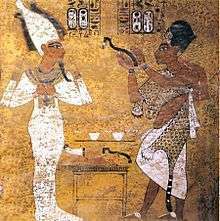 In the later Twelfth Dynasty, significant changes occurred in burials, perhaps reflecting administrative changes enacted by King Senwosret III (1836-1818 B.C.E.). The body was now regularly placed on its back, rather than its side as had been done for thousands of years. Coffin texts and wooden models disappeared from new tombs of the period while heart scarabs and figurines shaped like mummies were now often included in burials, as they would be for the remainder of Egyptian history. Coffin decoration was simplified. The Thirteenth Dynasty saw another change in decoration. Different motifs were found in the north and south, a reflection of decentralized government power at the time. There were also a marked increase in the number of burials in one tomb, a rare occurrence in earlier periods. The reuse of one tomb by a family over generations seems to have occurred when wealth was more equitably spread. Known graves from the Second Intermediate Period reveal the presence of non-Egyptians buried in the country. In the north, graves associated with the Hyksos, a western Semitic people ruling the north from the northeast delta, include small mud brick structures containing the body, pottery vessels, a dagger in a men's graves and often a nearby donkey burial. Simple pan-shaped graves in various parts of the country are thought to belong to Nubian soldiers. Such graves reflect very ancient customs and feature shallow, round pits, bodies contracted and minimal food offerings in pots. The occasional inclusion of identifiable Egyptian materials from the Second Intermediate Period provides the only marks distinguishing these burials from those of Predynastic and even earlier periods. The majority of elite tombs in the New Kingdom were rock-cut chambers. Kings were buried in multi-roomed, rock-cut tombs in the Valley of the Kings and no longer in pyramids. Priests conducted funerary rituals for them in stone temples built on the west bank of the Nile opposite of Thebes. From the current evidence, the Eighteenth Dynasty appears to be the last period in which Egyptians regularly included multiple objects from their daily lives in their tombs; beginning in the Nineteenth Dynasty, tombs contained fewer items from daily life and included objects made especially for the next world. Thus the change from the Eighteenth to the Nineteenth Dynasties formed a dividing line in burial traditions: The Eighteenth Dynasty more closely remembered the immediate past in its customs whereas the Nineteenth Dynasty anticipated the customs of the Late Period. People of the elite ranks in the Eighteenth Dynasty placed furniture as well as clothing and other items in their tombs, objects they undoubtedly used during life on earth. Beds, headrests, chairs, stools, leather sandals, jewelry, musical instruments, and wooden storage chests were present in these tombs. While all of the objects listed were for the elite, many poor people did not put anything beyond weapons and cosmetics into their tombs. No elite tombs survive unplundered from the Ramesside period. In this period, artists decorated tombs belonging to the elite with more scene of religious events, rather than the everyday scene that had been popular since the Old Kingdom. The funeral itself, the funerary meal with multiple relatives, the worshipping of the gods, even figures in the underworld were subjects in elite tomb decorations. The majority of objects found in Ramesside period tombs were made for the afterlife. Aside from the jewelry, which could have been used also during life, objects in Ramesside tombs were manufactured for the next world. Though the political structure of the New Kingdom collapsed at the end of the Twentieth Dynasty, the majority of burials in the Twenty-first Dynasty directly reflect developments from the earlier period. At the beginning of this time, reliefs resembled those from the Ramesside period. Only at the very end of the Third Intermediate Period did new funerary practices of the Late Period begin to be seen. Little is known of tombs from this period. The very lack of decorations in tombs seem to have led to much more elaborate decoration of coffins. The remaining grave goods of the period show fairly cheaply made shabties, even when the owner was a queen or a princess. Burials in the Late Period could make use of large-scale, temple like tombs built for the non-royal elite for the first time. But the majority of tombs in this period were in shafts sunk into the desert floor. In addition to fine statuary and reliefs reflecting the style of the Old Kingdom, the majority of grave goods were specially made for the tomb. Coffins continued to bear religious texts and scenes. Some shafts were personalized by the use of stela with the deceased prayers and name on it. Shabties in faience for all classes are known. Canopic jars, though often nonfunctional, continued to be included. Staves and scepters representing the deceased's office in life were often present as well. A figure of either the god Osiris or of the composite deity Ptah-Soker-Osiris could be found, along with heart scarabs, both gold and faience examples of djed-columns, Eye of Horus amulets, figures of gods, and images of the deceased's ba. Tools for the tombs ritual called the "opening of the mouth" as well as "magical bricks" at the four compass points could be included. Following Egypt's conquest by Alexander the Great, the country was ruled by the descendants of Ptolemy, one of his generals. The Macedonian Greek family fostered a culture that promoted both Hellenistic and ancient Egyptian ways of life: while many Greek-speaking people living in Alexandria followed the customs of mainland Greece, others adopted Egyptian customs, while Egyptians continued to follow their own already ancient customs. Very few Ptolemaic tombs are known. Fine temple statuary of the period suggests the possibility of tomb sculpture and offering tables. Egyptian elite burials still made use of stone sarcophagi. Books of the Dead and amulets were also still popular. The Romans conquered Egypt in 30 B.C., ending the rule of the last and most famous member of the Ptolemaic dynasty, Cleopatra VII. During Roman rule, an elite hybrid burial style developed incorporating both Egyptian and Roman elements. Some people were mummified and wrapped in linen bandages. The front of the mummy was often painted with a selection of traditional Egyptian symbols. Mummy masks in either traditional Egyptian style or in Roman style could be added to the mummies. 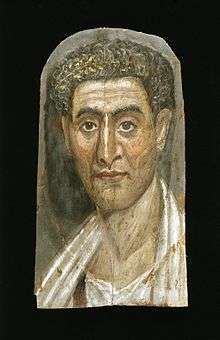 Another possibility was a Roman-style mummy portrait, executed in encaustic (pigment suspended in wax) on a wooden panel. Sometimes the feet of the mummy were covered. An alternative to this was a complete shroud with Egyptian motifs but a portrait in the Roman style. Tombs of the elite could also include fine jewelry. In the Prehistoric Egypt, bodies were buried in deserts because they would naturally be preserved by dehydration. The "graves" were small oval or rectangular pits dug in the sand. They could give the body of the deceased in a tight position on its left side alongside a few jars of food and drink and slate palettes with magical religious spells. The size of graves eventually increased but according to status and wealth. The dry, desert conditions were a benefit in ancient Egypt for burials of the poor, who could not afford the complex burial preparations that the wealthy had. The simple graves evolved into mudbrick structures called mastabas. Royal mastabas later developed into "step pyramids" and then "true pyramids." As soon as a king took the throne he would start to build his pyramid. Rituals of the burial, including the "Opening of the mouth ceremony" took place at the Valley Temple. While a pyramid's large size was made to protect against robbery, it may also be connected to a religious belief about the sun god, Ra. Anubis was the ancient Egyptian god associated with mummification and burial rituals. 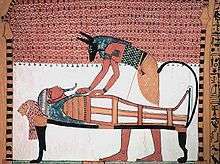 Here, he is shown attending to a mummy. In order to live for all eternity and be presented in front of Osiris, the body of the deceased had to be preserved by mummification, so that the soul could reunite with it, and take pleasure in the afterlife. The main process of mummification was preserving the body by dehydrating it using natron, a natural material found in Wadi Natrun which is like a combination of baking soda and salt. The body is drained of any liquids and left with the skin, hair and muscles preserved. This process was available for anyone who could afford it. It was believed that even those who could not afford this process could still enjoy the afterlife with the right reciting of spells. The most classic and common method of mummification dates back to the 18th Dynasty. The first step was to remove the internal organs and liquid so that the body would not decay. The embalmers took out the brain through a process named excerebration by inserting a sharp object in the nostril, breaking through it into the brain and then liquefying it. They threw out the brain because they thought that the heart did all the thinking. The next step was to remove the internal organs, the lungs, liver, stomach, and intestines, and place them in canopic jars with lids shaped like the heads of the protective deities, the four sons of Horus. The heart stayed in the body, because in the hall of judgment it would be weighed against the feather of Ma'at. After the body was washed with wine, it was stuffed with bags of natron. The dehydration process took 40 days. The second part of the process took 30 days. This was the time where the deceased turned into a semi divine being, and all that was left in the body from the first part was removed, followed by applying first wine and then oils. The oils were for ritual purposes, as well as preventing the limbs and bones from breaking while being wrapped. The body was sometimes colored with a golden resin. This protected the body from bacteria and insects. This was also based on the belief that divine beings had flesh of gold. The body was wrapped in bandages with amulets while a priest recited prayers and burned incense. The dressing provided physical protection and the wealthier even had a burial mask of their head. The 70 days process are connected to Osiris and the length the star Sothis was absent from the sky. Ay performing the Opening of the Mouth for Tutankhamun. After the mummy was prepared, it would need to be re-animated, symbolically, by a priest. The opening of the mouth ceremony was conducted by a priest who would utter a spell and touch the mummy or sarcophagus with a ceremonial adze – a copper or stone blade. This ceremony ensured that the mummy could breathe and speak in the afterlife. In a similar fashion, the priest could utter spells to reanimate the mummy's arms, legs, and other body parts. The priests, maybe even the king's successor, move the body through the causeway to the mortuary temple. This is where prayers were recited, incense was burned, and more rituals were performed to help prepare the king for his final journey. The king's mummy was then placed inside the pyramid along with enormous amount of food, drink, furniture, clothes, and jewelry which were to be used in the afterlife. The pyramid was sealed so that no one would ever enter it again. However the king's soul could move through the burial chamber as it wished. After the funeral the king becomes a god and could be worshipped in the temples beside his pyramid. 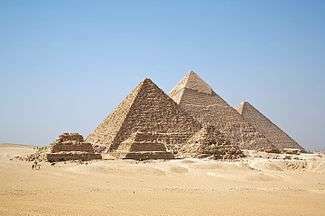 In ancient times Egyptians were buried directly in the ground. Since the weather was so hot and dry, it was easy for the bodies to remain preserved. Usually the bodies would be buried in the fetal position. Ancient Egyptians believed the burial process to be an important part in sending humans to a comfortable afterlife. The Egyptians believed that, after death, the deceased could still have such feelings of anger, or hold a grudge as the living can. The deceased were also expected to support and help their living family. They believed that the Ba and Ka are what enabled the dead to support their family. The Ba made it possible for an invisible twin to be released from the body to support the family, while the Ka would recognize the twin when it would come back to the body. With the ideas of the dead being so valuable, it is clear why the Egyptians treated the deceased with respect. The less fortunate Egyptians still wanted their family members to be given a proper burial. A typical burial would be held in the desert where the family would wrap the body in a cloth and bury it with everyday objects for the dead to be comfortable. Although some could afford mummification, most commoners were not mummified due to the expense. Oftentimes, the poor are found in mass graves where their bodies are not mummified and only with minimal household objects. If you were to find the bodies of the poor in Egypt they would be spread out throughout the desert, often in areas that are now populated. Having been preserved, the mummy was placed in a brightly painted wooden coffin. The decorations on the coffin usually fit the deceased's status. A central band contained symbols of rebirth bordered by panels with images of god and goddesses. The large djed pillar painted on the back of the coffin represented a backbone. This provided symbolic support for the mummy and was a place to write the deceased’s ancestry. Next, the first coffin was placed in another wooden coffin. Like the first coffin, it was in the shape of the mummy, but was more simply ornamented. The inside of the bottom was painted with a figure of a goddess. The lid again showed the deceased’s face, wig and sophisticated collar. There was an image of a scarab beetle with outstretched wings hovering over the mummy. Lastly, the mummy and coffins were placed in a rectangular outermost coffin mostly made of wood. Sometimes the wealthy had ones of stone, inscribed with religious texts. On the top of the coffin would sit a jackal, most likely Anubis, with various burial goods nearby. The Book of the Dead was a collection of spells designed to guide the deceased in the afterlife. Many mummies were provided with some form of funerary literature to take with them to the afterlife. Most funerary literature consists of lists of spells and instructions for navigating the afterlife. During the Old Kingdom, only the pharaoh had access to this material, which scholars refer to as the Pyramid Texts. The Pyramid Texts are a collection of spells to assure the royal resurrection and protect the pharaoh from various malignant influences. The Pharaoh Unas was the first to use this collection of spells, as he and a few subsequent pharaohs had them carved on the walls of their pyramids. These texts were individually chosen from a larger bank of spells. In the First Intermediate Period and in the Middle Kingdom, some of the Pyramid Text spells also are found in burial chambers of high officials and on many coffins, where they begin to evolve into what scholars call the Coffin Texts. In this period, the nobles and many non-royal Egyptians began to have access to funerary literature. Though many spells from the earlier texts were carried over, the new coffin texts also had additional spells, along with slight changes made to make this new funerary text more fit for the nobility. In The New Kingdom, the Coffin texts became the Book of the Dead, or the Funeral Papyri, and would last through the Late Kingdom. The text in these books was divided according to chapters/ spells, which were almost two-hundred in number. Each one of these texts was individualized for the deceased, though to varying degrees. If the person was rich enough, then they could commission their own personal version of the text that would include only the spells that they wanted. However, if one was not so wealthy, then one had to make do with the pre-made versions that had spaces left for the name of the deceased. If the scribe ran out of room while doing the transcription, he would just stop the spell wherever he was and would not continue. It is not until the Twenty-sixth Dynasty that there began to be any regulation of the order or even the number of spells that were to be included in the Book of the Dead. At this time, the regulation is set at 192 spells to be placed in the book, with certain ones holding the same place at all times. This makes it seem as if the order of the texts was not what was important, so the person could place them in an order that he was comfortable with, but rather that it was what was written that mattered. 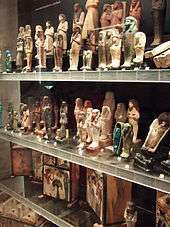 A selection of shabti statues. Although the types of burial goods changed throughout ancient Egyptian history, their purpose to protect the deceased and provide sustenance the afterlife remained. From the earliest periods of Egyptian history, all Egyptians were buried with at least some goods that they thought were necessary after death. At a minimum, these consisted of everyday objects such as bowls, combs, and other trinkets, along with food. Wealthier Egyptians could afford to be buried with jewelry, furniture, and other valuables, which made them targets of tomb robbers. In the early Dynastic Period, tombs were filled with daily life objects, such as furniture, jewelry and other valuables. They also contained many pottery and stone vessels. As burial customs developed in the Old Kingdom, wealthy citizens were buried in wooden or stone coffins. However, the number of burial goods declined. They were often just a set of copper model copper tools and some vessels. Starting in the First Intermediate period, wooden models became very popular burial goods. These wooden models often depict everyday activities that the deceased expected to continue doing in the afterlife. Also, a type of rectangular coffin became the standard, being brightly painted and often including an offering formula. Objects of daily use were not often included in the tombs during this period. The ancient Egyptians put green stone scarab beetles into the coffins of important people, along with the mummified bodies. At the end of the Middle Kingdom, new object types were introduced into burials, such as the first shabtis and the first heart scarabs. 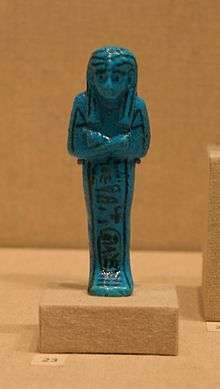 Shabtis were little clay statues made to perform tasks on command for the pharaoh. Now objects of daily use appear in tombs again, often magical items already employed for protecting the living. Scarabs (beetles) collect animal dung and roll it into little balls. To the Egyptians, these balls looked like the life-giving Sun, so they hoped that scarabs would bring them long life. Scarabs have been found in tombs and graves. In the New Kingdom, some of the old burial customs changed. For example, an anthropoid coffin shape became standardized, and the deceased were provided with a small shabti statue, which the Egyptians believed would perform work for them in the afterlife. Elite burials were often filled with objects of daily use. 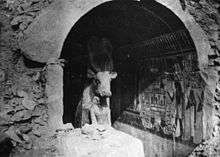 Under Ramses II and later all daily life objects disappear from tombs. They most often only contained a selection of items especially made for the burial. Also, in later burials, the numbers of shabti statues increased; in some burials, numbering more than four hundred statues. In addition to these shabti statues, the deceased could be buried with many different types of magical figurines to protect them from harm. Funerary boats are a part of some ancient Egyptian burials. Boats played a major role in religion because they were conceived as the main means by which the gods traveled across the sky and through the netherworld. One type of boat used at funerals was for making pilgrimages to holy sites such as Abydos. A large funerary boat, for example, was found near the pyramid of the Old Kingdom Pharaoh Cheops. ↑ Ancient Egyptian Mummies: A Web Quest for 4th-6th Grade (Social Studies), Lee Anne Brandt. Retrieved from the Wayback Machine internet archive on May 8, 2013. ↑ John A. Wilson, The Culture of Ancient Egypt, (Chicago: University of Chicago Press, 1965), p. 116. ↑ Bleiberg, Edward (2008). To Live Forever: Egyptian Treasure from the Brooklyn Museum. Brooklyn, NY: Brooklyn Museum. p. 71. ↑ Bleiberg, Edward (2008). To Live Forever: Egyptian Treasure from the Brooklyn Museum. Brooklyn, NY: Brooklyn Museum. pp. 71–72. ↑ Bleiberg, Edward (2008). To Live Forever: Egyptian Treasure from the Brooklyn Museum. Brooklyn, NY: Brooklyn Museum. pp. 72–73. ↑ Bleiberg, Edward (2008). To Live Forever: Egyptian Treasure from the Brooklyn Museum. Brooklyn, NY: Brooklyn Museum. pp. 74–77. ↑ Bleiberg, Edward (2008). To Live Forever: Egyptian Treasure from the Brooklyn Museum. Brooklyn, NY: Brooklyn Museum. p. 77. ↑ Bleiberg, Edward (2008). To Live Forever: Egyptian Treasure from the Brooklyn Museum. Brooklyn, NY: Brooklyn Museum. pp. 77–86. ↑ Bleiberg, Edward (2008). To Live Forever: Egyptian Treasure from the Brooklyn Museum. Brooklyn, New York: Brooklyn Museum. pp. 86–89. ↑ Bleiberg, Edward (2008). To Live Forever: Egyptian Treasure from the Brooklyn Museum. Brooklyn, New York: Brooklyn Museum. pp. 89–100. ↑ Bleiberg, Edward (2008). To Live Forever: Egyptian Treasure from the Brooklyn Museum. Brooklyn, NY: Brooklyn Museum. pp. 100–103. ↑ Bleiberg, Edward (2008). To Live Forever: Egyptian Treasure from the Brooklyn Museum. Brooklyn, New York: Brooklyn Museum. p. 103. ↑ Bleiberg, Edward (2008). To Live Forever: Egyptian Treasure from the Brooklyn Museum. Brooklyn, NY: Brooklyn Museum. p. 103. ↑ Bleiberg, Edward (2008). To Live Forever: Egyptian Treasure from the Brooklyn Museum. Brooklyn, NY: Brooklyn Museum. pp. 103–106. ↑ Burial Practices, Afterlife, & Mummies – Rosicrucian Egyptian Museum in San Jose Houses the Largest Collection of Egyptian Artifacts on Exhibit in Western North America. Web. 02 Dec. 2013. ↑ "How did ancient Egyptian embalmers work on the lower classes?" Courtasy.Discovery. Discovery Channel, n.d. Web. 23 Nov. 2013. ↑ Raymond O. Faulkner, The Ancient Egyptian Book of The Dead, (New York, British Museum Publications, 1985) p. 11. ↑ Starry Dog (2003). "History: Ancient Egypt". Biggest Ever Book of Questions & Answers. WS PACIFIC PUBLICATIONS, INC. p. 71. ISBN 978-1-4454-8792-2. ↑ Mary Ann Sullivan, Solar Boat/Funerary Boat of Cheops (Khufu), © 2001. Retrieved May 9, 2013. Allen, James P. (2000). Middle Egyptian: An Introduction to the Language and Culture of Hieroglyphs. Cambridge University Press. pp. 315. ISBN 0521774837. David, Rosalie (2002). Religion and Magic in Ancient Egypt. Penguin. p. 93. ISBN 0140262520. David, Rosalie. "Journey through the afterlife". Elsevier Ltd. 377.9759 (2011): pp. 20. Web. 10 May. 2012. Hornung, Erik (1999). The Ancient Egyptian Books of the Afterlife. Translated by David Lorton. Cornell University	Press. ISBN 0801485150. James, T.G.H. (2005). The British Museum Concise Introduction to Ancient Egypt. Ann Arbor, Michigan: University of	Michigan Press. pp 122. ISBN 0-472-03137-6. Kamrin, Janice; Ikram, Salima. "The Ancient Egyptian View Of The AFTERLIFE." Calliope 17.1 (2006): pp. 10	11. MasterFILE	Premier. Web. 7 May 2012. Taylor, John (2001). Death and the Afterlife in Ancient Egypt. University of Chicago Press.pp. 187–193. ISBN 0226791645.